However, yesterday, I finally put my foot down (ba-dum-bum!!) and ordered a pair. And I want them to come to my mailbox YESTERDAY. If you're oh-so-current with trends like me (cough, cough) and were also living under a rock when these became popular last year, you should buy yourself a pair, too! 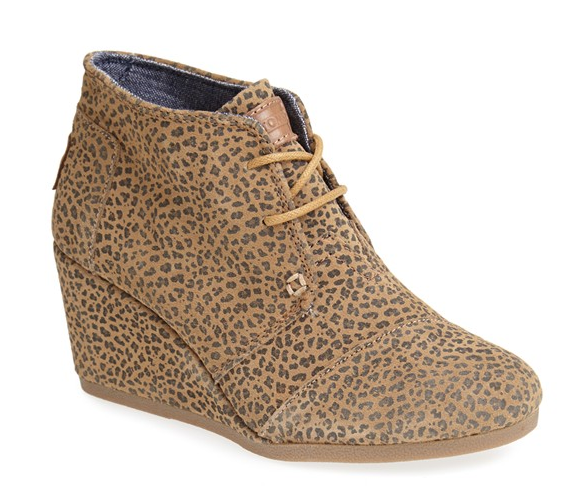 If you aren't a fan of prints, it comes in the taupe color and is just beautiful. My mom has these and loves 'em. These are freaking chic. I mean, if TOMS were ever considered sleek, these would be the shoe that earned them that title. 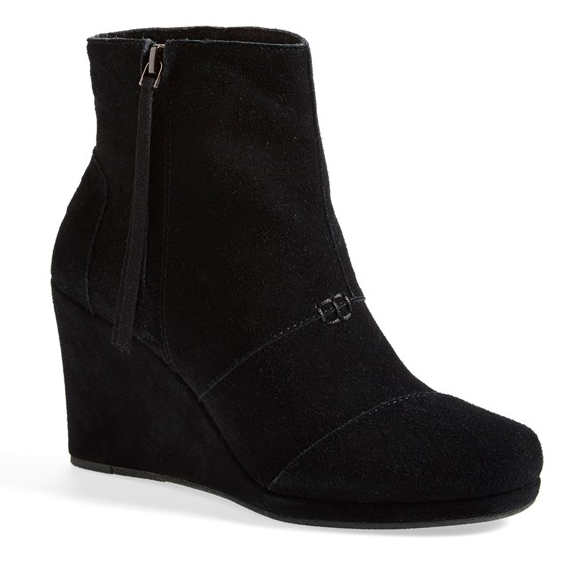 TOMS 'Desert' Wedge High Bootie in Black. I also love this one with the snakeskin sides...very cool. Here's a medium brown version. These will probably be the next pair I purchase. I think they'd get more wear than a riding boot (for me), since a bootie can be transitioned a bit more easily into spring. The Herringbone patterned pair has me in fits. LOVE. That's all she wrote, folks. Stay tuned tomorrow for a very touching and not-gag-inducing-at-all wedding anniversary post. Bring your tissues, (or your air sickness bags), ladies. Wow I would have never guessed that I would love TOMS so much. Theses are definitely getting added to my wish list! 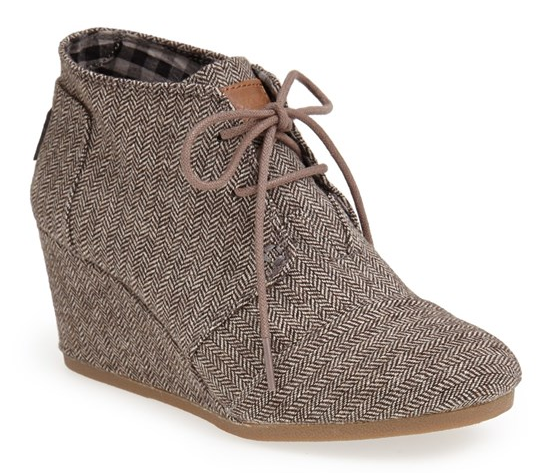 I bought the herringbone patterned ones during the Nordstrom sale about a month ago. I can't wait to wear them all the time! 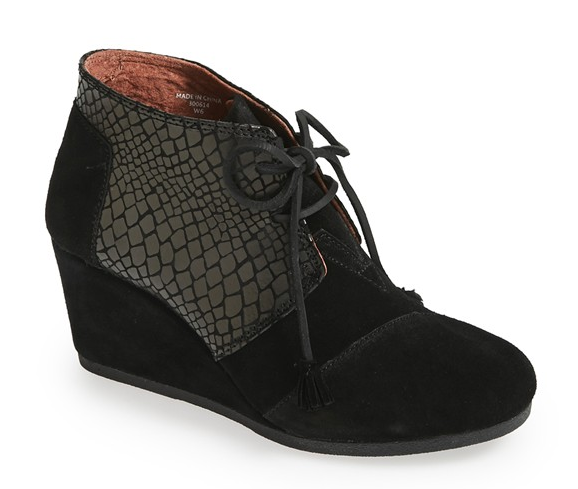 They have newish wedge sandals (different from the wedge peep toe they introduced a few years ago) that are FANTASTIC!! I get so many compliments on them, and people are shocked for find out they are TOMS. also, I'm sure you frequent Zulily, but they offer TOMS occasionally for pretty much BOGO! I think I might be *ahem* a little older than some of your readers - I have a teenager and I may have celebrated a fairly big birthday a few years ago, but I just wanted to tell you how much I've been inspired by your suggestions. I hadn't been to a LOFT store in years, but now I have the camo pants you blogged about a few weeks ago and a few other pieces, too. 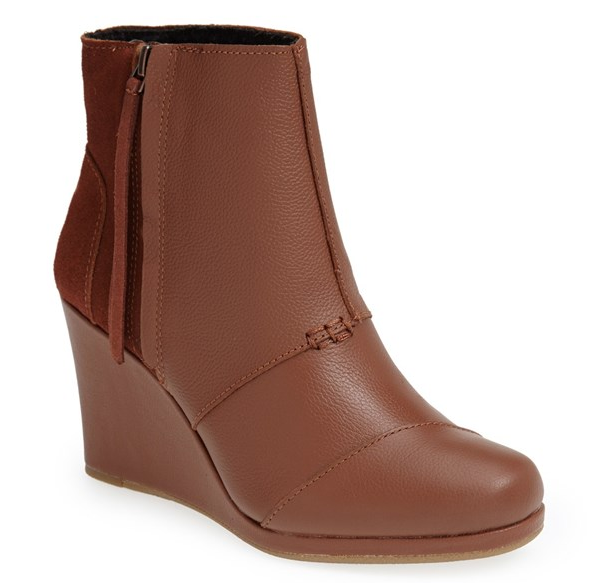 Last night I just had to go on Nordstrom to get the Desert Bootie. Thanks so much for the inspiration and the motivation to look a little more put together! Oh man. I love the cheetah, the herringbone, the snakeskin. LOVE. 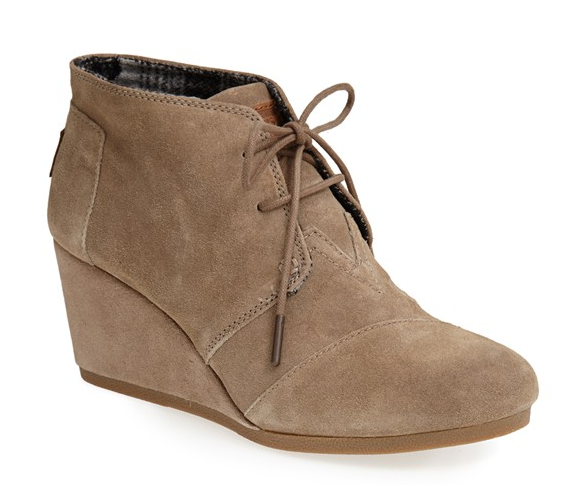 I am loving the options of various booties from Toms. Didn't realize TOM could be so chic! !